It is a pleasure to address you as the newly elected President of the Australian-Thai Chamber of Commerce. My ambition when I joined the Board five years ago, was to make the best possible contribution to the local Australian community. To have risen to a position of Vice-President and now to President is beyond my expectation but one I am honored to hold and will strive to serve the best interests of our members. We had another good turnout for the AGM and it is good to see the continued engagement of our member base with seven candidates standing for six available Board positions. Congratulations to the new board and I look forward to working with you over the coming year, as we drive greater value to our membership. Thailand also plays an important role in the hosting of ASEAN this year, and we can play an important role in Australia developing that business relationship with Thailand. Thank you to Charles Wrightman and Angus Kent who completed their 6 year tenure on our Board, and who have made notable contributions to the Chamber during their terms. Special thanks to outgoing President, Brenton Mauriello, whose leadership and enthusiasm during the past three and a half years has been demonstrated in the growth of membership, events, activities and a greater engagement with both the Australian Embassy and the community. We look forward to his continued contribution on the Board, as well as in his capacity as the President of AustCham ASEAN. 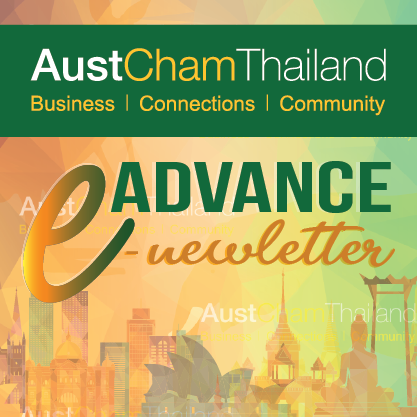 The topic of Australia-ASEAN relations will be ever present this year as Thailand hosts ASEAN, and there will be a significant number of events held during 2019, which will allow members to both access opportunities and contribute to Thailand’s economic goals as ASEAN Chair. The activity within our committees continued to increase. Each of these committees worked tirelessly during the past year to deliver a range of events tailored to the needs of our members, and we are encouraged by the attendee numbers which indicates that these are of direct relevance to you all. We welcome more members to get directly involved with the Chamber and offer their insights and experience by contributing to one (or more) of these. If you have an interest in a particular area such as manufacturing, digital, hospitality, education, advocacy, and alumni, then please do contact us. April Sundowners will be held at SO Sofitel Bangkok and we are fortunate to have Andrew Biggs lead our pre-Sundowners briefing on the topic of “Upskilling English Language Communication in the Workplace”. Sundowners has become synonymous with Austcham and the greater expat community here in Thailand and our calendar is full already with wonderful venues provided by our members. In May we will have an opportunity to personally welcome the new Australian Ambassador H.E. Mr. Allan McKinnon, who will hold a session at the pre-sundowners members briefing. Before then AustCham will again support those wishing to attend theANZAC memorial services at Kanchanaburi on April 25, starting with the dawn service at Hellfire Pass followed by the ANZAC Day service in the township at 11 am – I strongly recommend that you make the effort, it is an emotional experience. If you want to attend please contact the Chamber; we will provide information and arrange travel and accommodation as needed. In early May, the country welcomes the coronation of His Majesty the King Maha Vajiralongkorn. This should be a truly memorable period for all of those that will have the opportunity to experience it. We join in Thailand’s celebration to mark this auspicious occasion.